With a strict waste management code that Vancouver – North Vancouver and West Vancouver included - and Burnaby have in place, there has been a rise in services for bin rentals in this region of Canada. The objective is to dispose waste and garbage in a responsible and eco friendly manner to prevent health, ecological, and natural hazards. Bin rentals take care of all kinds of waste and garbage through their containers that range from 5 cubic meters to more than 20 cubic meters in size. They are specialists who separate materials like metal, wood, cardboard, rubber, and paper from all the noise and send it for recycling. Approximately 90 percent of all the waste produced by households, offices, and industries can be recycled and bin rentals make sure that it happens. To avail such services, you just need to make a call and consult them to order a container that will take care of the nature and scale of the waste you are about to dispose. It will then be dropped off at a designated place whenever you require. Bin rentals provide containers that are very easy to load and handle. You can take as many hours or as many days as you want to dump all un-required material in the bins provided. Once you are done with the loading, the container is picked up from your doorstep. A very affordable means to make waste disappear and be reused, different bin rentals charge differently based on bin size, waste weight and distance traveled. 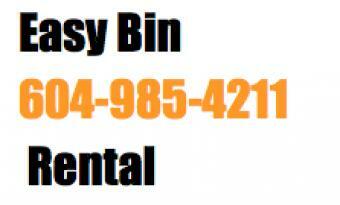 Call for bin rentals for a door-to-door service to minimize effort and be a responsible citizen. Waste Management Made Easy by Bin Rentals Bin rentals take care of all kinds of waste and garbage through their containers that range from 5 cubic meters to more than 20 cubic meters in size. Watch our Easy bin rental video. Watch our easy dumpster rental service in Vancouver.